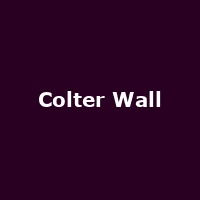 "Colter Wall is a Saskatchewan-born songwriter and musician. Steeped in Old Timey material and traditional Americana, Wall's sound is comprised of resonate and raw baritone vocals, Folk and Bluegrass style guitar and banjo picking, steady kick-drum stomping, and visually provoking, story telling lyrics. Wall Draws influence from legends of the past such as Hank Williams, Robert Johnson, Bob Dylan, Johnny Cash, Townes Van Zandt, and The Band, as well as more modern Americana pioneers including Shovels and Rope, Jack White, Ray Lamontagne, and Shakey Graves."